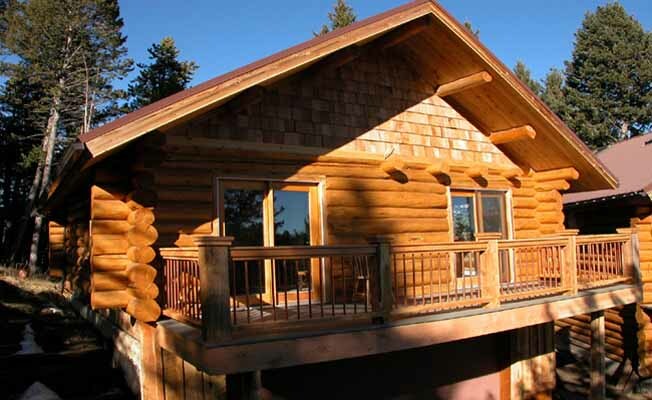 Crafted from hand peeled, Swedish-coped logs in the year 2000, Blue Moon is the perfect Montana vacation cabin. Two beautiful decks overlook the forested hills on which Blue Moon is located with views of the Bridger and Absaroka Mountains in the distance. This secluded location makes a great base for creating an incredible Montana vacation experience. Close to Bozeman and Livingston, both towns offer a unique blend of small town hospitality, great restaurants, numerous art galleries, museums and local history. Ideally suited for two people, Blue Moon Cabin can sleep up to four. There is one loft bedroom, one full bath and a fully stocked kitchen. The cabin's cozy, yet elegant decor and our attention to detail create a relaxing and inspirational ambiance. Regular wildlife viewings are a part of the cabin's wilderness experience with black bear, fox, coyote, deer, elk and moose being some of the wildlife that frequent this area. The location couldn't be better for the outdoor enthusiast. The north entrance to Yellowstone National Park is an hour's drive from the cabin, world class fly-fishing in the Yellowstone River and Paradise Valley's famous Spring Creeks is just minutes away, and both downhill and cross-country skiing are only a 16-mile drive. There's also hiking, biking, and snowshoeing. You name it, southwest Montana has it! For complete information regarding the cabin, including rates and availability, please go to our website: www.bluemooncabin.com or give us a call at 877-404-6477.